Editor’s Note - In the Summer of 2018 Isobel Glover set out to complete the Vancouver Island (Spine) Trail on foot, becoming the first woman to hike the entire length of the Island. On the extensive hike, she encountered challenging weather, summit setbacks and various route re-directions. 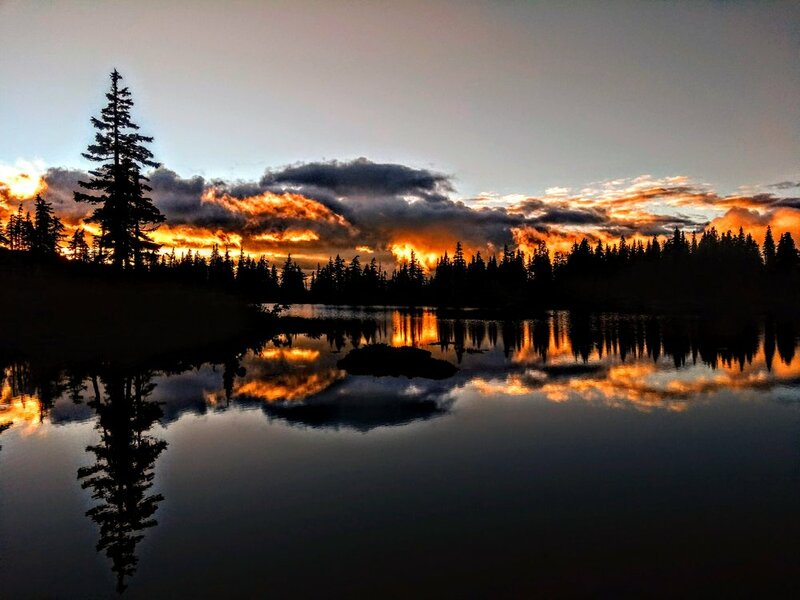 She writes of these in detail, but also goes into beauty of backcountry isolation and the quiet scenes one only gets from being away from city conveniences. Thanks for sharing your story with us Isobel and congrats on your phenomenal journey! It started as an itch to do something big and challenging, and a recurring desire to start walking one day and not to stop. So that’s just what I did. On summer solstice, June 21st 2018, I walked out of my front door in Victoria with a daypack. The action itself was familiar and inconsequential, but I would not be returning home until I reached the opposite tip of the Island, every step of the way on foot. The ridge on Mt. Ashwood. The Vancouver Island Trail, also known as the Spine Trail, is a wilderness trail that stretches the length of Vancouver Island, passing through its heart and along its spine. This trail is remarkable in its variety: from following rivers in valley bottoms to mountain traverses to rugged coastline, it passes through every part of what makes Vancouver Island such a spectacular place. For years this trail was just an idea, but through incredible amount of work and dedication, it is becoming a reality. The work is ongoing: some parts of the route are well-established, some parts are brand-new and barely cleared, and a few places remain as concepts. The trail is now just at the point where it is feasible to follow, with a lot of extra work and route planning to fill in the gaps, which gave me a chance to be the first person ever to complete this route and as far as I know, the first woman to hike the length of Vancouver Island. Starting in Victoria, the lower Island was a hodge-podge of trails: beginning on the Galloping Goose and passing through the urban centre of Victoria my route followed the multi-use Great Trail through the rolling hills of the Cowichan Valley and along the banks of the Cowichan River. After passing through Port Alberni came the first mountain range: the Beauforts. I traversed the ridge of this rugged, incredibly bushy low-level range, hitting 10 peaks in 6 days. There was trail booted in from time to time but much of the route was bushwhacking and route-finding, often relying on maps and tracks with little detail. My hiking partner at the time retreated midway through the range when weather turned and I had two and a half days of complete whiteout with only a few metres of visibility, plus gusting winds and piercing rain. Hiking, I would pause periodically to wring my socks and empty the puddles from my boots and at night I would go to bed in wet clothes, waking up shivering every few hours. But on my final night, just as I arrived at my camp spot by Clifton Lake, the fog finally cleared into a magical evening. The low sunlight illuminated the clouds and the trees on the opposite bank, the lake perfectly calm. The openness and isolation on this final night was absolutely intoxicating. In our day-to-day lives how often are we somewhere where we can yell as loud as we possibly can and know that nobody can hear us? When can we dance, completely naked, wherever we want, without a fear of another soul? For me, this is freedom. 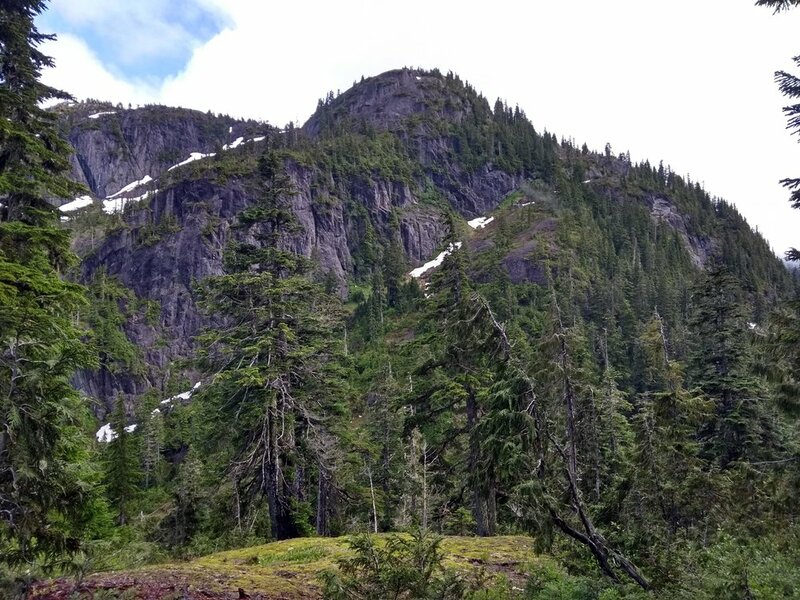 After staying in Cumberland a few nights, my next section was an eight-day leg to get to Strathcona Dam on the opposite side of Strathcona Park, with the terrain a combination of park trails, bushwhacking and logging roads. I hiked with two experienced companions in this section: they had lots to teach me and we worked well as a team. The days were long and hot: with route uncertainty the hiking days were often 12, even 14 hours and in the middle of the Island’s July heat wave. Over three consecutive days I climbed three over-6000 foot peaks: Jutland, then Mt. Mitchell as a side trip from our camp by Pearl Lake, then Mt. Adrian, at 1870m, the highest elevation of my expedition. There were so many moments of extraordinary, majestic beauty through these mountains. We camped one night on the ridgeline, just below the peak of Mt Adrian, after a long, rough day including a 1000m climb. The spot was beautiful: the ground was a bed of heather, snowmelt fed a web of rushing streams and waterfalls, intermingling as they ran down one side of slope, and the evening was clear and still. I watched the sun set over the ridge ahead, the sky red and orange, then turning to green, blue, and dark purple along the skyline, a sea of peaks. Orange, yellow and pink reflected on the majestic jutting cliff face of Adrian behind us and the crescent moon hung in the late evening sky with Venus at its corner. If I ever think of peace in my life it is this moment. After this, luck worsened: my food made me sick and we ran into a dead end on the ridgeline, requiring a day-long bushwhack to drop off the ridge and find a logging road, the alternative route plan. That evening ended in a second dead-end, this time a road end and then an impassable gully. The next day we rerouted and ended up walking the Parkway by Buttle Lake for the last 30km before the dam. It was hard not to think of this as a failure at the time, but ultimately my goals - to walk every step of the way and follow my planned route as closely as possible - were still met and, more importantly, I learned far more through this section than I could have imagined. The next section was not majestic like the ridgelines, but instead humbling. Where before I felt on top of the world, balanced on a peak or a ridge, I now felt immersed in the world, surrounded by forest, water, and life and smaller than everything. I passed through the homes of the elk, grateful for their trails carpeted with their footprints. I glanced a herd of them just once, thundering off as soon as I drew near. Following moving water for days on end and going wherever it took me gave introspection and perspective. If any part of my trek felt like a traverse, this was it. During this section I could not see my surroundings or progress, but more than any time before I could feel the passage of time and distance, day by day. I resupplied in Woss and then climbed into the mountains for my third, final, and most daunting mountain traverse: the Bonanzas. The Spine Trail has no route through this section and temporarily circumnavigates it along an old deactivated railway. I was determined to go through the Bonanza range so I built my own route. The first day out of Woss the plan was to make it to a small group of alpine lakes with guaranteed water but after a 1200m elevation gain to Mt. Markusen that was steeper than expected, wrestling through thick krumholtz, blueberries and copperbush much of the way it became clear it wouldn’t happen. This made for a very thirsty afternoon. I remember at one point thinking that I could never possibly be stressed or unhappy again as long as I had water - the feeling didn’t stick but I think about it a lot. The route plan was changed to drop off the ridge, down a steep and wet bushwhack. I never realize how much I miss the coast until I see it again: I had not seen the ocean since leaving Port Alberni more than a month before. After passing through Port McNeill, I followed the coast: the trails that existed in places along my route were easily lost so eventually my companion and I decided to walk the beach wherever we could. These three days between Port McNeill and Port hardy were full of adventure: we waded rivers, bushwhacked through virtually impenetrable salal, saw bears, seals and sea lions, slept through a thunderstorm one night and to top it all off, managed to camp below the tide line in a salt marsh, only to wake up a few hours into the night with the tent half floating in the ocean. The last section of the Spine Trail follows the full length of the North Coast Trail. Typically, people who hike this trail will take a water taxi from Port Hardy to the trailhead on the far side of Shushartie Bay. 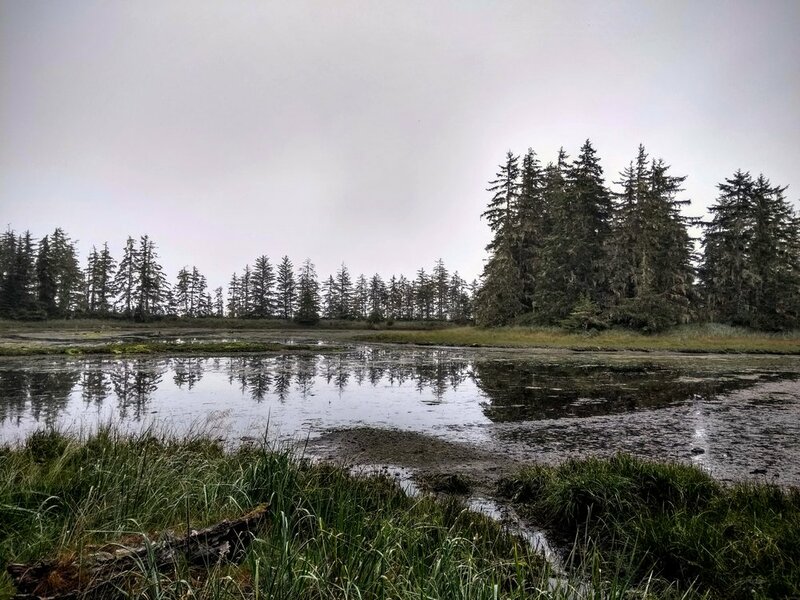 I was determined to walk, so I hiked two days and 50 km along logging roads and then bushwhacked through dense coastal salal and across the Shushartie Bay estuary to make it to the trailhead. Through the North Coast Trail it was a challenge to stay focused on where I was and not to wish for the end that was now so close and attainable. Liminality hung over me: I was on the edge of something that had been my single focus for so long and about to step back into my previous life. I made an effort to focus on little details and on each moment of hiking: the scenery, as ever, was stunning: wide sand beaches with wolf prints, coastal creeks rushing into estuaries, barren bogs with twisted jungle trees, tide pools and rock formations sometimes smooth and worn, sometimes sharp and craggy, and sea life in every colour all under a blanket of overcast and fog with an eerie glow from the smoke that hung in the air. My family and a friend met me for my last two days of the trail so I wouldn’t finish alone. Arriving at Cape Scott was, for the most part, underwhelming: it felt like just another day, another step, another spot to stop for lunch. The weight of it hit me for just a moment on the walk back to camp from Cape Scott - I did it, I really did it. I stopped and cried for a minute on the trail and then continued on my way. If I learned anything from my journey, I learned gratitude. Throughout my trek I felt so many things: Hunger, thirst, fear, joy, euphoria, despair, and absolute contentment. My trip forced me to be grateful for many of our daily comforts: water, food, shelter, warmth, and companionship, and it taught me to savour the world. In every moment of our lives we are immersed in life and wildness and beauty and all there is to do is see it. I would like to say a huge thank you to everyone who supported my journey. I couldn’t have done it without my committed team of companions, resuppliers and logistical support, the wealth of information and encouragement from members of the Vancouver Island Trail Association, and the financial support from the Jen Higgins fund of the ACC and the Youth Memorial fund of the ACC Vancouver Island Section.